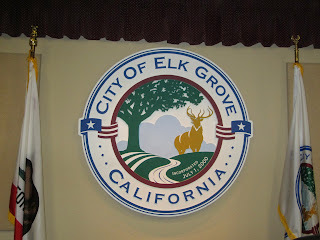 Taking its cue from Tuesday night's heated exchange at the Sacramento City Council regarding staffing for Mayor Kevin Johnson, tonight's deliberations on the same topic also drew a testy exchange between two members of the Elk Grove City Council. Although the council decided by a 4-1 vote for increased staffing, it was accomplished only after a contentious exchange between Council Members Steve Detrick and Steve Ly. At stake was whether or not to increase staffing for each of the four council members and Mayor Gary Davis. Currently the mayor and the council members are allotted a 12-hour per week assistant to aid in administrative matters. Following a report from City Manager Laura Gill regarding various staffing options, the council heard from one member of the public who questioned the need for additional staffing. Elk Grove resident Ed Owen reminded the council members the responsibilities of a council member were well known before taking office and questioned the need for the additional staffing expense. "You don't need to have someone go arrange to have lunch or go to a banquet," Owen said. "I think you are asking a lot from the taxpayers." Speaking first during council deliberations was Davis, who offered a lengthy rationalization for his need of a full-time assistant. Davis said he Googled other similar sized cities and found several full-time job descriptions. "It is part of the evolution of many, many cities across the country," he said. "I don't think it is a stretch." Davis noted that people assume because Elk Grove is a growing city and that the mayor is directly elected, it is a full-time position. He went on to say if he had a full-time assistant, that person could aid in such activities as "drafting talking points" and being part of the city's economic development team. Davis said the assistant could "enable the mayor to be really proactive on initiatives. Focused employer cold calling. Someone that is saying 'Alright, we're going to coordinate 10 employers we are going to knock on the doors of.' I would love to have the staff support to do something like that." "That is an interesting perspective, I have to admit," Detrick said immediately after Davis' presentation. "The mayor's role is very little different from the rest of the council members." Detrick went on to say with the exception of the one term he served as mayor, during his six years on the council he was able to complete all his duties without the services of an assistant. He added the most constituent service requests or inquiries he receives are ably handled by city staff and that he monitors them to ensure fulfillment. "This has worked extremely well," he said. "And I think that Laura [Gill] likes it that way." After hearing Davis' pitch Council Member Darren Suen said he could appreciate why the mayor's needs are different than the rest of the council. "I do know that there is a different, higher perception of the need for response when you are the mayor," Suen said. "And you know, that's just the way it is." Ly offered a rambling, non-linear justification on how additional staffing would make him a better council member. The first-term council member said that after his day job, most nights he is meeting with constituents. "I am advocating for more support of council members," he said. He went on to suggest that council members need additional staffing to ensure that emails are answered, phone calls returned and that all letters receive a response. By having someone assisting in that, Ly said, will make council members better leaders. "For me, that is what I have come to know," he concluded. Following Ly's comments, Davis was confused by his protege's comments asking for clarification. "Councilman Ly, can I get a sense where you are on the specifics of what we have been talking about here," Davis said. Ly went on to say that if other council members are not using the assistant hours allotted to them, he suggested they be pooled for use by others. He also said he would be willing to support a full-time assistant for the four council members and one for the mayor. Detrick responded immediately asking Ly "How long you been on the council?" Ly responded he has been a council member since last year and that he has been a public servant for much longer. "I've been a public servant for 41-years," Detrick said. "To your point sir," Ly responded. "I've been on this council for six years, and I've given the highest level service without an assistant," Detrick said. "To say that you need an assistant to do your job well, I don't buy that." Detrick added, "If you don't have an intern you can't do a good job? I'll tell you right now that's a load of crap." Ly pushed back and said that having an intern with more hours would make him more effective. After Detrick's and Ly confrontation, Vice Mayor Pat Hume chimed in saying he agreed with the point that Detrick was making. "I don't want to get down in the weeds on this," Hume said to Ly. "But your assertion was that if they [constituents] want or expect a responsive council member, that council member has to have an assistant, I disagree with that premise." After further discussion, the consensus was that the mayor would be allocated an administrative assistant rather than an executive assistant that he hoped for, and each city council member could increase the hours of their assistant to 19-hours per week. Detrick was the sole dissenting vote. "We can move on now," Davis said. "I want to say, these are good sessions to have and I appreciate that we were able to have it." I wanted the throw up watching this. How embarrassing to our city on so many fronts. Detrick was right, but totally unprofessional. Mr. Coffee ( I like that moniker for the mayor) was very nervous and rambling as usual. He knew what he was asking for was wrong. He was like a little kid trying to explain to his dad how the car window got smashed. Suen despite a well-educated head on his shoulders can't stand up against anyone or anything.He needs to take a stand. He just looks like a Davis follower, drinking the Mr. Coffee kool-aid. He obviously is uncomfortable with confrontation. I was disappointed in Hume for allowing this giant waste of tax money to get pushed through with all our more important needs unfulfilled. Couldn't believe he voted for this waste of tax dollars. If Mr. Coffee is too busy with his new businesses to run our city, then he needs to step down. I have a strong feeling that he'll have a very difficult time getting reelected making these kinds of decisions. It seems he consistently shoots himself in the foot at every opportunity. ...that person could aid in such activities as "drafting talking points" and being part of the city's economic development team": YEP, IT'S DEFINITELY GROW TIME! "By having someone assisting in that, Ly said, will make council members better leaders": SORRY TO BURST YOUR BUBBLE HERE, BUT THE LACK OF ADMINISTRATIVE ASSISTANTS IS NOT WHY ELK GROVE IS THE LAUGHING STOCK OF THE SACRAMENTO REGION AND BOTTOM FEEDERS OF THE HOUSING MARKET. LEADERSHIP? OH PLEEZ! The demand of time is an assumed "perk" of taking the council position. If you do not have the time to serve your City, don't run for office. Service is more than two Wednesdays a month. While Davis may be making poor decisions as of late (always to some of you), he is to be commended for how much time he gives to the public. I do not care that Ly or anyone of these individuals have personal jobs, their expectation is to serve their City. If you can't do both, don't. Now that Davis got the assistant he needed, let hope that he will fix the job to housing imbalance, which he cited as one of the reasons for his spending request. Let hope that "IT'S GROW TIME" is not going to be a problem of getting the job done. Bottom line is, Davis has to show us fruitful RESULTS of his leadership. This city is "the joke" of the region because of years of corruptions, it is not one bad decision. Mr Detrick's approach last night reminds me of the old adage - "If your only tool is a hammer, then everything looks like a nail". That was like watching some Reality Show last night. Maybe we could have our own, "Naked & Afraid in Elk Grove." We could loop a Developer & a Councilperson together and see who would come out licking their wounds. Detrick was spot on and he was right to take Ly down a peg or two. Ly's arrogant sneer needed to be wiped off his face. Who is Ly to infer that you can't possibly be effective without additional staff? Sorry... Ly's too big for his pants and needed scolding. Friends, you don't need additional staff to lead in the best interests of the city. Detrick was the only one with the balls to call him on it. Mayor has a full-time Assistant and council has had the hours extended for them....sooo no more excuses and we expect to see some ground-breaking shortly on the Civic Center, Aquatics Center, Veterans Hall, Senior Center, Animal Shelter, etc. plus some major jobs coming to town. Mr. Ly just broke my heart when I heard he was so understaffed and had been working so many hours the last 4-5 months...maybe even wishing he had honored his tenure with the EGUSD. after listening to the tape from last night, i'd like someone to tell me what the hell did Lie say? he rambled on and on and literally, no one in my house could understand a freaking thing he said. he does love to hear himself talk. Mayor doofy did himself proud. he twist words to make them what he wants to hear; pat hume failed last night to protect our money and detrick, while on the right track, acted like a teenager..and suen, well, he was just disappointing. i can not believe any of the logic that went into this decision. for years, interns have been good source of labor; the interns learning government and the council getting some help. but now, mayor doofy has too much to do and needs an assistant. is this assistant a civil servant? who does this assistant report to? who does the eval? who decides what this assistant does? will this assistant help with political campaigns? will this assistant keep detailed record of what he/she does for council? too many questions and no answers. this was a terrible waste of money; but we have come to expect that from this council..suen especially needed to show some independence, but he failed...i think suen is made of marshmallows..lean on him this way, he'll predictably will react; lean the other way, and so he goes. lie is just plain stupid...why does he keep bringing up the school board? does he not understand those are apples to oranges? what the hell was he rambling on about anyways? i will admit, detrick finally said want i wanted to hear, but he should have taken a little more professional stand...but in my heart, i was cheering him...they certainly doesn't happen too many times. shame on the rest of the clowns for spending money that could have gone into roads, infrastructure, general fund accounts, etc...but no, we had to pad the staff. i guess we need to expect great things now from mayor doofy. we've waiting a great long time, so lets see something quick. Just had to listen after your comment Anon.20:17. I totally agree....what the h--- did he say???? What's also "a load of crap" is Councilman Detrick signing a legal stipulation that he has paid back a $93.,000 illegal misappropriation of campaign funds in an effort to reduce additional penalties and charges, when in fact he did not pay the money back. Mr. Detrick to date has refused to comment on this, leading a reasonable person to believe that he is guilty of the deceit and fraud. Any innocent party would provide evidence contradicting these charges post haste if there were any such evidence. That, my friends, is " a load of crap." I couldn’t believe an elected official of this city would be so crass as to say, “That’s a load of crap” to another councilman from the dais. But what was interesting is that Hume knew a line was crossed and felt the need to speak up, not once, but twice, to try and clean of the mess of his tactless colleague. Why does Hume feel the need to do that? So Hume may not need an intern but certainly has added “Clean Up Man” to his council resume. I agree with the above poster re: Detrick and his refusal to even address the issue at the council meeting of the $93,000 he stole from his campaign supporters for his personal use. He had every opportunity to explain himself or ask for forgiveness for his misdeed(s). Yet he didn't even address the issue. If he's right and we're all just a bunch of apathetic head-in-the-sand people, our city is headed into the toilet. He's obviously counting on this. I'm not sure how or Davis sleeps at night. When did it become so difficult to tell right from wrong and so hard to just do the right thing? We all need to wake up and stop our leaders from ruining out city. I don't know about cleaning up, but I, for one, was thankful at least one councilman could express himself using appropriate words in complete sentences. Fruitless at the end of the day, maybe, but it did highlight by contrast elevating the level of civil discord.